Mulhern will take the No 25 jersey for 2015 and has agreed a new three-year contract with the Challenge Cup holders. Rhinos left a vacancy when their squad numbers were announced last November and Mulhern was competing with the likes of full-back Ashton Golding and winger Ash Handley to take the final shirt. The 20-year-old, who impressed in Rhinos’ pre-season games, has been dual-registered with Hunslet Hawks and played in their opening Kingstone Press Championship fixture against Featherstone Rovers on Monday. Mulhern, whose younger brother Frank plays for Leeds United and Ireland under-18s, said: “I was really pleased to sign a new contract with the club. “Brian McDermott (Rhinos’ coach) has been good with me over the past few years and helped me progress in my game. When I think how far I have come in the last year it still shocks me, but I know there is still a long way to go. Mulhern – who played for Castleford Panthers and Normanton Knights and had a spell in Wakefield Trinity Wildcats’ academy system – added: “I have had a good off-season and I am benefiting from working with Barry Eaton at Hunslet. “Barry is obviously part of the Rhinos coaching team too so I know if I impress for the Hawks Brian will be keeping a close eye on me. “Being awarded the 25 shirt for the squad numbers is the icing on the cake. 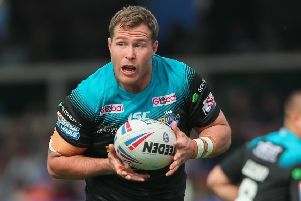 “There has obviously been a lot of chat about who would get it, but I think it is great that the Rhinos reward their young players and give them a shot to prove themselves in Super League. McDermott reckons Mulhern, who made three senior appearances for Rhinos last season, is a potential star of the future. “Rob has impressed everyone at the club with his workrate and attitude over the last few years,” said the coach. “He will really benefit from playing in the Championship with Hunslet at the moment as he has only played for the under-19s up until this point. Meanwhile, St Helens’ prolific winger Tommy Makinson has signed a new four-year contact with the Super League champions.